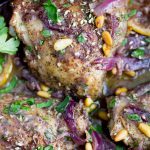 Delicious roast chicken thighs recipe with Middle Eastern flavors. Easy. Prep ahead. Worthy of a special occasion. In a large bowl, mix chicken, onions, lemon, garlic, 4 tablespoons olive oil, spices, broth, salt, and pepper. Marinate in the fridge for at least 3 hours or overnight. Make The Topping: While the chicken is roasting, line a plate with a double layer of paper towels. Heat the remaining tablespoon of oil in a small frying pan over medium heat. Add the pine nuts and cook, stirring constantly, until they turn golden. Transfer to paper-towel-lined plate, to absorb the oil. To Serve: Transfer the hot chicken, onions and lemons to a serving platter. Pour pan juices over the chicken pieces. Sprinkle chicken with extra za’atar if you like and sprinkle with chopped parsley and toasted pine nuts. Serve hot.